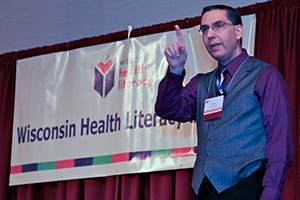 Wisconsin Health Literacy offers training and/or consulting services customized to an individual organization and/or specialty. This training includes discussion about health literacy and its connection to health outcomes. Additional content would be determined in consultation with the organization to best meet identified goals and objectives. For more information, contact Stan Hudson, Wisconsin Health Literacy Director, (608) 257-1655, ext. 2, or stan@wisconsinliteracy.org. The following interactive modules are customized for each organization and include presentation material, activities, and time for discussion. They can be provided individually or packaged as desired. MODULE 1: Literacy and Health Literacy 101 (1 hour): Participants will learn about the prevalence of adults with low literacy, the challenges and assets of adults with low literacy, the role of shame, and red flags for identifying adults with literacy challenges. 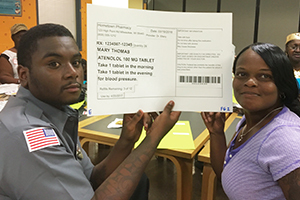 They learn the definition of health literacy, the prevalence of low health literacy in America and the connection between low health literacy and specific health outcomes. This module also introduces participants to the various categories for health literacy intervention, including plain language written and oral communication. MODULE 2: Oral Communication (1 hour): Oral Communication provides opportunities for participants to engage in hands-on activities and games that build plain language communication skills. Activities include Simplify©, a card game that asks participants to reduce the use of medical jargon, and role playing of the Teach-Back Method, a technique for immediately evaluating patient understanding. MODULE 3: Written Communication (1 hour): Written Communication is an introduction to the concept of plain language written communication, including practice and hands-on activities. This module can be tailored to groups of health care professionals whose primary role is not related to communications or patient education, but who may need to occasionally develop materials or assess the suitability of materials they provide to patients. A checklist for assessing suitability is provided to all participants. 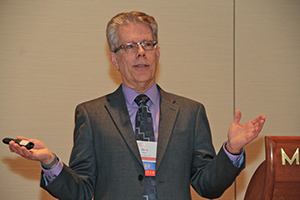 Experienced professionals, including physicians, offer presentations on health literacy and patient centered communication. Content includes how health literacy affects organizations and its customers. Presentations are customized to an organization’s specific needs and audience, and include actionable suggestions the audience can use immediately. Services include review and rewriting of printed materials to improve readability and understanding. These might include forms, discharge instructions, patient education brochures, or marketing materials. Plain language experts provide a review and evaluation of website ease of use and site content language. Included are usability studies by individuals with lower literacy levels.